I am working with Live2d 3.0 and successfully in import and make new model from Cubism editor to Unity. But when a prefab of model generated, I drop it in the scene and try to animated in Unity Animation Window, it didn't work. In detail, the model work perfectly when I hit button Play, but when I trying to adjust animation by timeline, it doesn't. Please check the screenshot. Please point me out the mistaken or guide me to make it work, so I can add animation event easier and more exactly. As you know, the values on each parameters can be changed on the Inspector. Cubism 3 SDK refers to these value and by pushing play button they are reflected in the Timeline of Unity. The slider doesn't work if it is moved without play button. Oh, I mean the model animate normally, but the timeline not move even the button was hit or not. 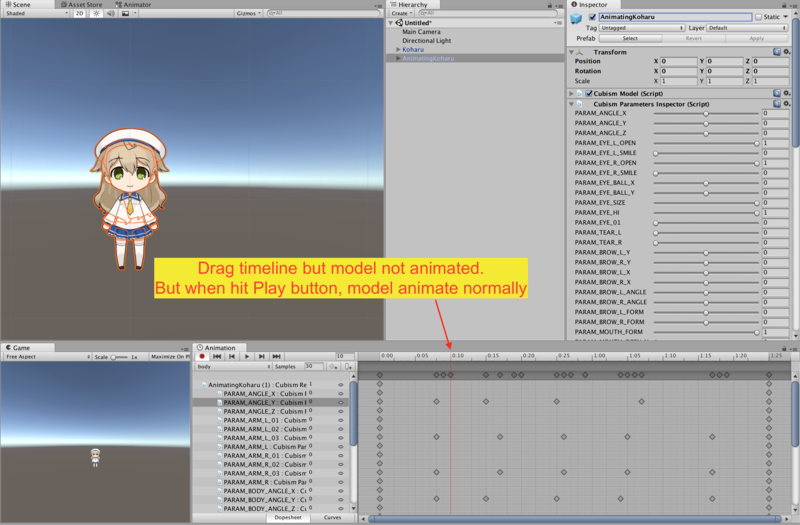 So the problem is: the timeline of unity animation not reflex animation of the model. It is difficult for us to add event and preview with unity's animation. In this video, you will see, when I want to play animation of model, the timeline not update corresponding. Is there anything wrong with my setup or this feature is not support by live2d? Thanks for detailing the issue. What you would like to do is possible by customizing Cubism 3 SDK's components. The components you can get on our GitHub are fully customizable for each user's preference. If you wouldn't like to touch the components, the motions on timeline can be changed by modifying the motions in Cubism 3 Editor then import of the data to Unity again.